These fish cutlets are a Maldivian snack food or hedhika (short eat). We've had terrible experiences in the past trying to make fishcakes so I hope these cutlets work out. The usual three bowl breading technique is ready to go. A bowl of flour, egg and breadcrumbs. Chop the onion as finely as you have patience for and mix it with the drained tuna, curry powder, chilli, salt, pepper, chilli flakes and the juice of the lemon. Chop and boil the potato until it is soft. Add it to the tuna mix. Squish the tuna mix into small balls and then lead them through the breading process. Deep fry them to within an inch of their lives and then arrange prettily on a fancy looking rectangular plate for show. Yet another dessert recipe and this time it's from the African land-locked country Burundi. Melt the butter and mix well with the sugar. Add the eggs making sure they are well blended before adding another. Mix in the flour, salt and baking powder. Grease a square baking pan and add half the cake batter. Cover in a layer of chopped banana. Next, a layer of chopped dates goes on top. Cover with the remaining cake batter and bake at 180C for 30 minutes. This is where my cake went wrong. I was in the kitchen while it baked making chutney. JD and Leigh were also there and we were all dancing about and singing to Hairspray songs. The chutney was almost done and I was furiously stirring it because I could smell burning. Yep, it was the cake. :( Not only did it burn quite badly it also (quite sulkily I thought) refused to come out of the pan in one piece. It didn't stop Leigh enjoying it though. She loved it and ate most of what wasn't burnt. It did taste delicious, it's a shame it didn't work out. Another dessert recipe, this time from Burma. 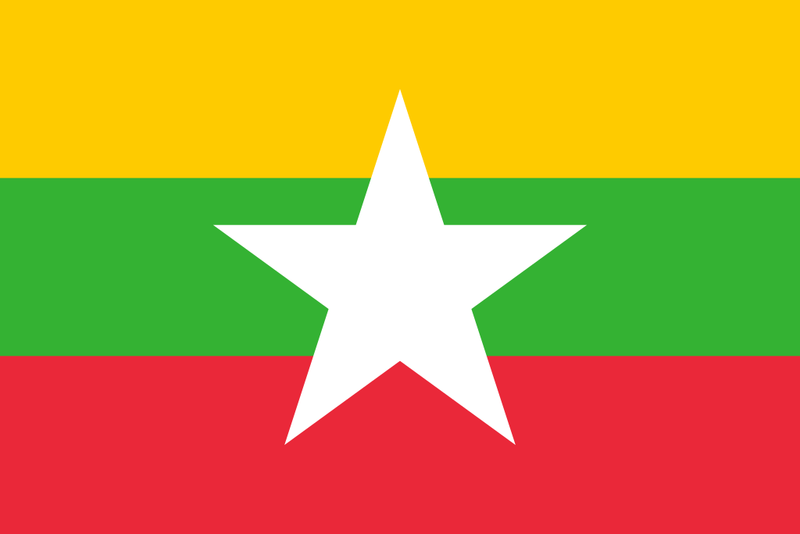 Burma has had a new flag and name since 2010 and is now officially the Republic of the Union of Myanmar. I'm still calling it Burma for this because it was in my original list of countries as Burma. Toast the semolina in a pan on a medium heat until it's golden brown. It smells so good as it toasts. Mix the eggs, coconut milk, brown sugar and salt together then stir it into the semolina. It's all lumpy but don't worry. Add the butter and continue to stir as it melts. You should have a lovely smooth mixture now. Pour into a greased oven pan and bake at 190C for about 30 minutes. I felt suspicious that this was going to be one of those recipes that don't work out for me. Things that are meant to firm up and set usually don't. It did work though and it tipped easily out of the oven pan onto the counter. Cut it into squares and eat while it's still warm.